It was with great pleasure that the independent transport videos cameras were invited by the Ribble Vehicle Preservation Trust to film their second Lytham Hall Running Day. After a successful event in 2014 the Trust decided to repeat the event again on Bank Holiday Monday, 31st August 2015. The RVPT are well known for their superb collection of former Ribble and associated vehicles. A number of their vehicles can also be seen at their other showcase event – the Morecambe Running Day that takes place each May, which our cameras attended in 2012 and 2014. A superb event, and as you will see the Lytham Hall event is of the same excellence! We start our programme in the early morning at the RVPT’s Freckleton depot. Here we record the run out into service of the participating vehicles, from the 1930s Leyland Lion and Cheetah right up to the most recently completed preservation project, 1976 built Park Royal bodied Leyland Atlantean AN68 number 1397 (NRN 397P) resplendent in NBC Poppy red livery with a white band. Our cameras then jump aboard 338 (NCK 338J) the Bristol RESL6L with B47F ECW bodywork for the journey to Lytham Hall. On arrival we enter the grounds through the archway and travel along the long driveway to the Hall where the other arrivals are being positioned. There is a good variety of former Ribble buses and coaches, as well as a London Transport Routemaster, RML2716 (SMK 716F). Representing local municipal fleets were two Blackpool Leyland PD3As, 501 (HFR 501E) and 512 (HFR 512E), Lytham St Annes number 10 (JTD 381) a Leyland bodied PD2 and number 24 (TJ 6760) a 1934 Leyland Lion, formally a Leyland demonstrator, now restored to the highest standard. 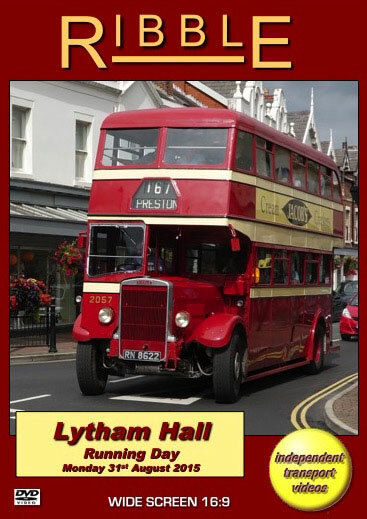 A ten-minute service was operated from the Hall to Fairhaven Lake via Lytham town centre ensuring that there was a preserved bus in sight for most of the day in the town. This made an interesting comparison with the modern Dennis Tridents of Blackpool Transport and the ALX400 bodied Tridents and Enviro 400 double deckers of Ribble’s successor, Stagecoach. We now take a ride on Ribble 1481 (TRN 481V) an ECW bodied Atlantean AN68 to the Lake and then onto the promenade near to the town centre. We capture the action as time is turned back but for the modern cars and buses! We then travel on Ribble 2057 (RN 8622) a 1939 Leyland TD5 with a 1949 Alexander lowbridge body to the Lake and back to the Hall. From the Hall we board the beautifully restored 1934 Leyland Lion in the dark blue and ivory livery of Lytham St Annes Corporation for our journey to the Lake and back, with a brief stop to see the preserved tram shelter on Clifton Drive. From the Hall a further journey is made on Ribble 2101 (GFR 101W) an ECW bodied Leyland Olympian to Ballam Road and Clifton Street in the town to film more action for you to enjoy. As the day draws to a close we see the vehicles leaving the Hall. We board Ribble 1568 (RN 7824), another excellently restored vehicle, being a petrol engined Leyland Cheetah LZ2 with a most comfortable Brush C31F body for our journey back to Freckleton. As the vehicles are put away we must say thank you to the Ribble Preservation Trust for providing an excellent event, which I hope you will enjoy as you relive the day through this programme.